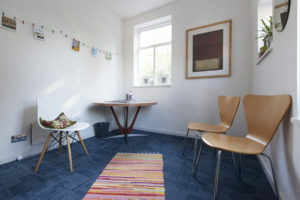 I am based in a dedicated and fully equipped therapy room that is designed to be friendly, calm and welcoming. It is set in a peaceful and private building next to the River Thames in Putney. Parking is free from 10.30am. All sessions are an individualised reflection of each client’s needs; Parent and/or Young Person/ Child. Child centred therapy may include play, rhythm, storytelling, role play and creative work as well as talking therapy. Sessions are available to Parents,Young People & Children at £70 per 60 minute session payable each week OR £600 for 10 sessions payable at the first session by cash, card or cheque. Workshops are available on relevant topics within school and organisational settings. Please contact me to confidentially discuss your needs. My Office Hours are Monday to Saturday 10.30am-4.30pm.